The operator is licensed in Curacao and operates under the License No.1668/JAZ issued by the Curacao Gaming Authority. It’s owned by WL Services N.V. When it comes to its product, does Nederbet Casino deliver the goods? Yes, it does. The operator features a casino, live casino, sports betting, poker and mobile gambling. The same concept applies to its game variety powered by the best igaming vendors like Betsoft, Evolution Gaming, iPoker, Microgaming, Net Entertainment and Play’n Go. As such it offers multiple cash games ranging from slots machines (3D, three and five reel varieties), table games, towering jackpots to video poker, all under one umbrella. What’s the magic formula to its multiple platform? An unconventional but effective strategy that involves building confidence and competence with its players. In principle, the operator is aware of its strengths and limitations, both aspects which we’re going to explore in this review. To welcome you through its virtual doors, Nederbet Casino offers a welcome bonus of 100% up to €100. This bonus is only available to Western European players. Alternatively, it offers a sign on bonus of 100% up to €25 plus 25 free spins to players outside Western Europe. If you want to qualify for the bonus a mere €25 will do. Before the bonus money can be converted into real cash it must be rolled over 30 times the deposit and bonus sum (60xb). Games that count towards the play-through are all slots. The operator also offers a sign on bonus to play live casino games, poker, mobile and sports betting. Make sure you understand each bonus’ terms and conditions before you accept it. Once you’ve accepted a bonus you have 7 days to meet the playthrough. One of the key elements of a reputable cyber casino is its support. It’s pretty evident that Nederbet is able to put the mission and goals of the organization ahead of its own interest. Instead of building up an ego, it pursues results. Support is available 365 days per year through email or telephone. The staff of the casino are professional and eager to help. It also contains a frequently asked questions section that covers questions about security, how to play, how the wagering requirements work, fair play, promotions and deposit options. If you’ve just signed up, it will only stand you in good stead if you go through them quick. Gambling is addictive. This is why the operator lists the contact details to various gambling anonymous organizations such as GamCare, Gordonhouse and Gamblers Anonymous on its webpage. If you’re a compulsive gambler please contact any of the organizations, help is free of charge. Only players 18 years and older are allowed to sign up. Standard verification checks will be done to determine whether a player is within the allotted age limit or not. If you’re on a monthly budget; you can decide how much cash you want to wager within a session. The usual self-exclude option is available to problem gamblers too. Afraid that your personal details will be sold or divulged to any third party other than the casino? Two reasons why you don’t need to be concerned. First, the software of Nederbet Casino is protected by Secure Socket Layer (SSL) encrypted software. Second, under the data protection act of Netherlands Antilles, operators licensed here are not allowed to sell their customers’ personal details to any person or organization. Are the games are fair? Yes they are. Nederbet Casino states that the RNG (random number generator) is tested regularly for any discrepancy and fairness. The Microgaming games are tested at least once a month by eCOGRA. Are the wagering requirements attached to the bonuses fair? Yes, but I must be honest that the playthrough attached to them are slightly above industry standards. 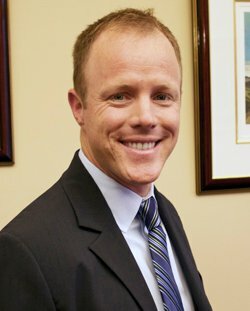 Are progressive jackpot wins included in the withdrawal limit? To the best of my knowledge, no. Wins stemming from progressive jackpots will be paid out in one lump sum. In summary. Being present in the moment enables the operator to give its undivided attention to one thing at a time: your needs as a player. It manages to cut out the noise by providing a website that covers gambling holistically. So far it has no player complaints against it which is another feather in its cap. However, it can lower the bonus wagering and increase the bonus amount to both Western and non-Western European players. When it comes to its promotional offers, Nederburg Casino offers a little bit of everything. It caters to a divers group of players, be it a casino, live casino, poker, sports betting or mobile. Each gambling category comes with its own set of promotions and rewards. Regular players receive free spins, reload bonuses and can also participate poker tournaments (satellites). The more you wager the more you’ll be rewarded. The operator’s VIP program starts of with basic blue and ends with gold. Every time you play you receive FPP’s (frequent player points) which can be converted to cash. 1000 points equals $4. Bear in mind that any cash reward is based on the current exchange rate. If you want to cash out 90.000 FPPs. Send an email and ask support to convert 90.000 ($8 per 1,000 points) points into cash. According to the table, you will receive $720.00. Therefore, 90.000 points is 90 x $8 = $720.00. Before you can make a single bet at the site you must deposit at least €25 or currency equivalent. You can only use one of the following deposit methods: E-wallets (Neteller, Skrill), Maestro, MasterCard, Visa, Paysafecard and iDeal. The minimum withdrawal amount is €25 and the max. withdrawal amount is €10,000 per month. Deposit could be made in Euros, British Pounds or U.S Dollars. Withdrawals through e-wallets will be processed within 6 hours (maybe sooner), wire transfer, visa (credit and debit cards) up to 5 business days. A fee will be charged, but this depends on the deposit method you’ve used. The game selection is as robust as it gets and caters to players from all walks of life. The majority of the games consist of Betsoft, Microgaming, NetEnt and Play’n Go slots machines. They come in all shapes and sizes from 3 to 5 reels classics, bonus rounds, multipliers, scatters and wilds. My top games are Thief, Gold Factory, Bananas, Gonzo’s Quest, Pinocchio, Safari Sam and Thunderstruck II. This is one game where you can beat the house consistently. However, it depends on your skill level and the type of video poker game you’re playing. Games that round of the game menu are Jacks or Better, Deuecs Wild, Joker Poker, All American and Bonus Poker. The good news is that it’s not all about slots. 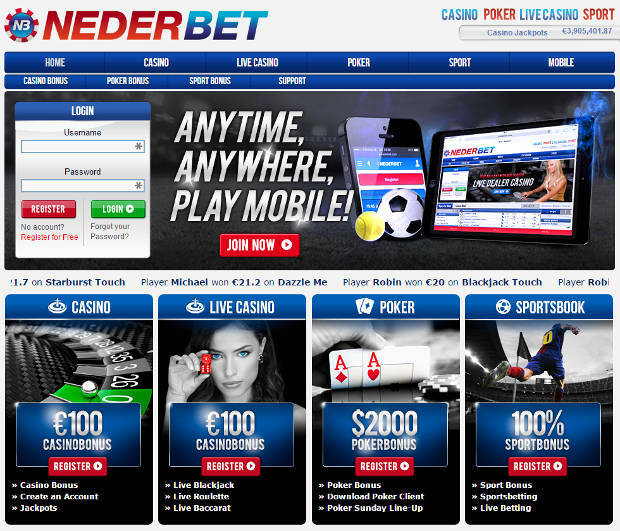 Nederbet Casino offers a sports betting section to sports enthusiasts. Now, you can place a bet on your favourite soccer team or tennis player-you name it the site’s got you covered. To sweeten the pot it even throws in a sign on bonus $25. The live dealer section is divided into three sections: the NetEnt, Evolution and Microgaming live games. You can play blackjack, baccarat, Texas Hold’Em and roulette against the dealers. These games are streamed to your computer via webcam from a live studio based in Latvia. In other words the games take place in real time and, what for it, there’s no random number generator involved. The mobile games are HTML5 compatible. What does this mean? It means that games can be played from all mobile devices (iPhones, iPads, tablets). You can play slots, poker or place a bet on your favourite boxer or participate in tournaments such as the Dutch Eredivisie or the English Premier League.